My Mom has been making mini biscuits for parties for years! They are her “signature” item at baby showers, holiday parties…you name it. So when she says “OH MY WORD. I’M CHANGING MY RECIPE TO THIS ONE FROM NOW ON!”…you know it’s good. That’s exactly what she said when she tried these mini cheddar biscuits. Hands down, the cutest and tastiest bite sized biscuit around. Let’s talk about this recipe! I recently received an email from King Arthur Flour introducing their new self-rising flour and the fun news that some of it was on its way to me so I could try out some biscuits! Sure don’t have to ask me twice to make biscuits…and then eat them! No problemo. Got ya covered. Now, y’all know me. I wasn’t just going to make “biscuits”. 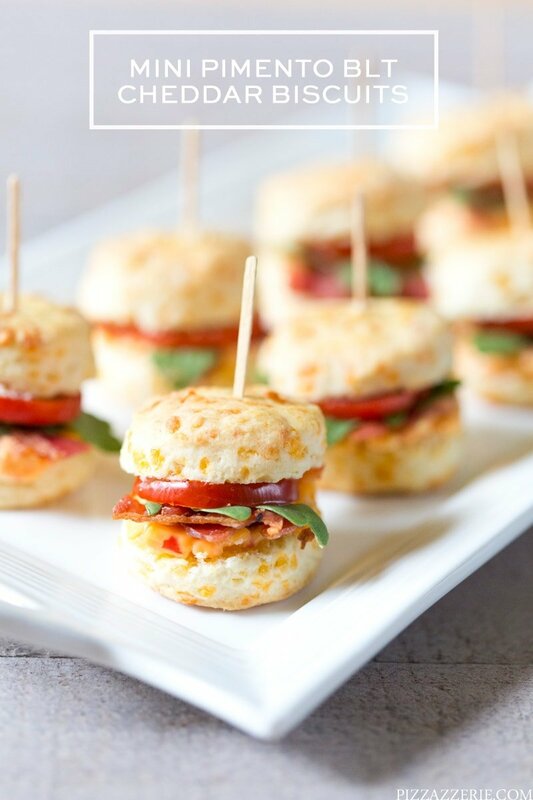 I was going to make itty bitty biscuits filled with sharp cheddar cheese and topped with pimento cheese, bacon, lettuce, and tomato. Boom! 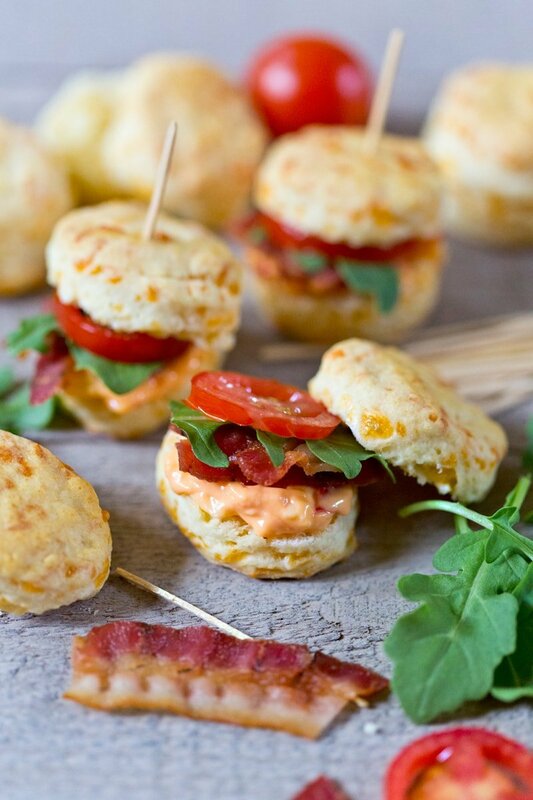 The Mini Pimento BLT Cheddar Biscuits were born! They’re about as southern as it gets. Not only that, they would make a delicious addition to almost any occasion! So up your brunch game..or your baby shower game..or your dinner party appetizer game..just be sure to tell your friends the recipe because they’re going to want it! 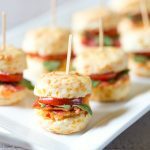 Try this delicious bite sized savory treat for parties or a simple weeknight dinner! Preheat your oven to 425°F, with a rack in the upper third. To make the dough by hand: Grate or shred the cheese; you should have about 1 cup. Toss it together with the flour. Add the cream, stirring to make a cohesive dough. Transfer the dough to a lightly floured work surface. Pat the dough flat 3/4" to 1" thick; the thicker the disc, the taller the biscuits. Bake the biscuits for 10 minutes, until they're golden brown. Remove them from the oven. Slice each biscuit open (once cooled enough to handle). Layer on bacon, arugula, and slice of cherry tomato. Top with other half of biscuit. Use a toothpick to skewer together. Enjoy! I love tailoring recipes to fit my favorite flavors so you can certainly do the same. Swap the pimento cheese out for another spread or leave it off altogether. Thinly sliced ham and a dab of honey would be another dynamite combo. 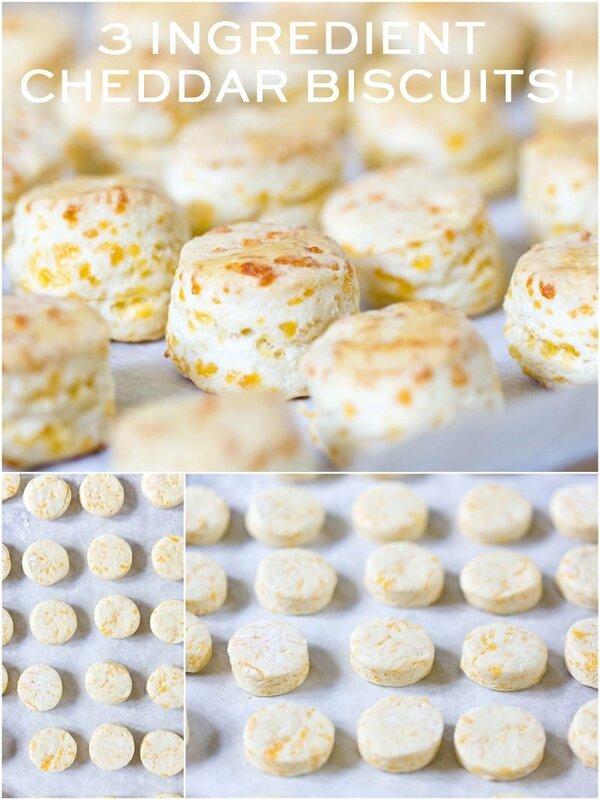 Or just pop these biscuits straight onto a serving tray as is and watch them quickly disappear! Be on the lookout for some more party food recipes coming soon! You know I love all things mini so I’ll be taking a few favorite dishes and turning them “itty bitty”. Get ready! My son is a sucker for cheddar biscuits. I will have to add this recipe to my arsenal. Yay! Thanks for the comment (and for pinning!)! These look like they were rolled ala ‘slice and bake’ style??? Great idea if so. I’m hosting a tea-party themed baby shower for 85 guests, and will have to make as much ahead of time as possible. Can the biscuits be frozen until needed? And if so, was is the maximum length of time that you would recommend freezing them? Thanks for the recipe, and for your suggestions! and the liquid ingredient 1 cup 8 oz. heavy cream. I must say this is not the easy recipe of make cheddar biscuits. Hi, Courtney. I may be a bit dense, so I will ask the Dumb Question. In your ingredients list you say “2 cups 8 ounces..flour”. Since 8 ounces = 1 cup, are you saying I need a total of 3 cups of flour? Same with the heavy cream. You say “1 cup 8 ounces”, so do I need a total of 2 cups of cream? Hi Sharon! Thanks for catching that. It’s just 2 cups flour! Thanks, Courtney… is it also just 1 cup heavy cream?